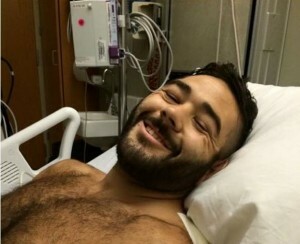 Roseburg, Oregon’s Mercy Medical Center confirmed today that Umpqua Community College shooting survivor Chris Mintz has been released from the hospital. Thirty-year-old Mintz, an Army veteran and student at Oregon’s Umpqua Community College, was shot seven times last Thursday while trying to save his peers from a gunman’s rampage. Mintz suffered seven gunshots and two broken legs. He is one among seven injured in the mass shooting that took the lives of nine, not including the shooter himself. Witness Hannah Miles told ABC News that Mintz ran into the school library telling people to run while pulling fire alarms to sound the alert. “He actually ran back towards the building where the shooting was,” Miles said. Mintz’s cousin launched a GoFundMe campaign to raise money for medical bills and physical therapy. “He is a father, a veteran, a student, and now he’s a hero,” the post reads. So far, the campaign has raised nearly $794,350. The goal was $10,000.